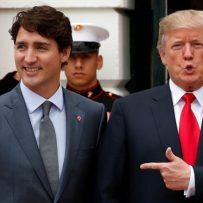 When Prime Minister Justin Trudeau signed the new North American Free Trade Agreement with U.S. President Donald Trump and outgoing Mexico president Enrique Peña Nieto on Nov. 30, he added one caveat on the milestone day. Yet, two months after signing the trade deal, the tariffs – 25 per cent on steel and 10 per cent on aluminum – that were imposed under the guise of national security concerns remain in place against Canada, with no end in sight. 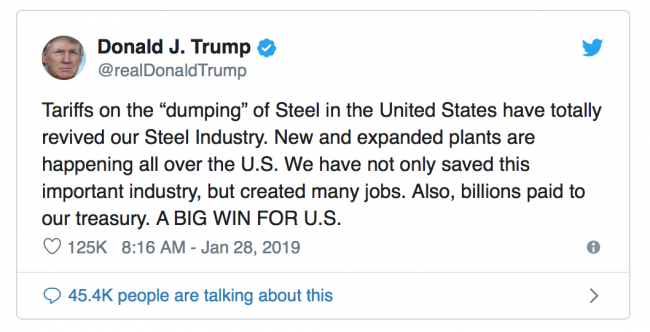 Earlier this week, Trump even touted the tariffs’ impact on the steel industry in a tweet, calling it “a big win” for the U.S. The tariffs, and Canada’s dollar-for-dollar countermeasures, have created unintended consequences and headaches for businesses on both sides of the border, prompting corporate and government leaders to press the U.S. government to remove them. “Given the assurance by [Trump] that if there was an agreement on NAFTA, that the tariffs would come off … we should be strongly making the case that these come off — and now. This is unfinished business that needs to be dealt with,” said Perrin Beatty, president and CEO of the Canadian Chamber of Commerce, in a phone interview with BNN Bloomberg. Even for U.S. steel and aluminum makers, the initial boost that the tariffs provided for the industry have had a short shelf life – a common fallout of government-imposed tariffs, according to Christopher Plummer, president and managing director at Pennsylvania-based consulting firm Metals Strategies Inc.
Plummer noted that the average price for hot-rolled steel sheet, a bellwether for the industry, rose sharply from its average price of US$687 a ton in January 2018, to about US$833 a ton in March when the tariffs were officially enacted. After peaking at an average of US$912 a ton in July, prices have steadily fallen and stood at US$663 a ton as of Friday morning. “In other words, we’re now worse off – at least, in the steel pricing environment – than we were back in January, three months before these tariffs were imposed,” Plummer told BNN Bloomberg in a television interview Tuesday. Meanwhile, Canadian steel and aluminum producers have not only weathered the storm, but performed better amid the tariffs and improvements in cost efficiencies, according to Plummer. Like their U.S. counterparts, Canadian steel manufacturers also reaped the benefits of the immediate increase of steel prices, Plummer said. Still, for Canadian consumers, the tariffs’ impact on sticker prices could just be starting to appear. Grocery chain Metro Inc., for example, said earlier this week that it has accepted price increases from some soft drink suppliers because aluminum tariffs have made cans more expensive. In addition, appliance makers have passed down higher prices to Canadians as a result of the tariffs, according to Mark Agnew, senior director of international policy with the Canadian Chamber of Commerce. And it could get worse, Agnew said, when more data is released for the end of 2018 and early 2019. “That’s when we’ll see things register a bit more. Right now, people are locked into contracts or obligations, so we haven’t necessarily seen the shifts take place yet,” Agnew said in a phone interview. For now, there are no guarantees on when, or if, the Trump administration will eliminate the metals tariffs on Canada and Mexico; but some say that the ratification of the new trade deal could be a bargaining chip to pressure the White House into finally removing the so-called Section 232 levies on its North American counterparts. Indeed, Republican U.S. Senator Chuck Grassley, chairman of the Senate Finance Committee, on Wednesday urged the White House to lift the tariffs before Congress begins considering legislation to implement the new trade deal. “There’s ongoing conversation taking place in Congress that [the Trump administration] will have a difficult time passing the new trade agreement if tariffs continue, and on Canada in particular,” said Bruce Heyman, former U.S. ambassador to Canada, in a phone interview.